The relentless fright fest franchise finally comes to an end. Did it deliver? Does anyone even care? BE WARNED. This will be a brief exorcism of the franchise in its entirety. For those who have yet to see the sequels, avert your eyes. I loved the first Paranormal Activity. It revitalized the found horror footage genre and became the new Blair Witch Project. A supernatural sleeper hit that inevitably spawned a ridiculous franchise. These films were always a guilty pleasure BUT that’s not to say that I’ve enjoyed every offering. The second Paranormal entry was a mess. A mere re-tread of the original with weaker results. I know. Some of you will say, “Isn’t that every Paranormal sequel?”. BUT Paranormal Activity 3 brought an actual story line and introduced the creepy entity Toby and his mysterious cult of devil worshipers. It was a crucial turning point and sparked my curiosity. Intrigued to see where this would go. Tragically the fourth film was just like the second with a new family. And the fifth, The Marked Ones, felt like something completely different BUT out of sync with the rest of the movies. That was until the closing minutes which introduced another aspect that cleverly (if rather loosely) tied the movies together. The notion of a ghost dimension through a devil door. Opening portals and merging time frames. Insane. So I endured this mixed bag of a franchise. Finally seeing the light at the end of the tunnel. Desperate to see how this would end. Would everything finally be explained? The cult, Toby, the ghost dimension? In a nutshell, no. It crashes and burns. 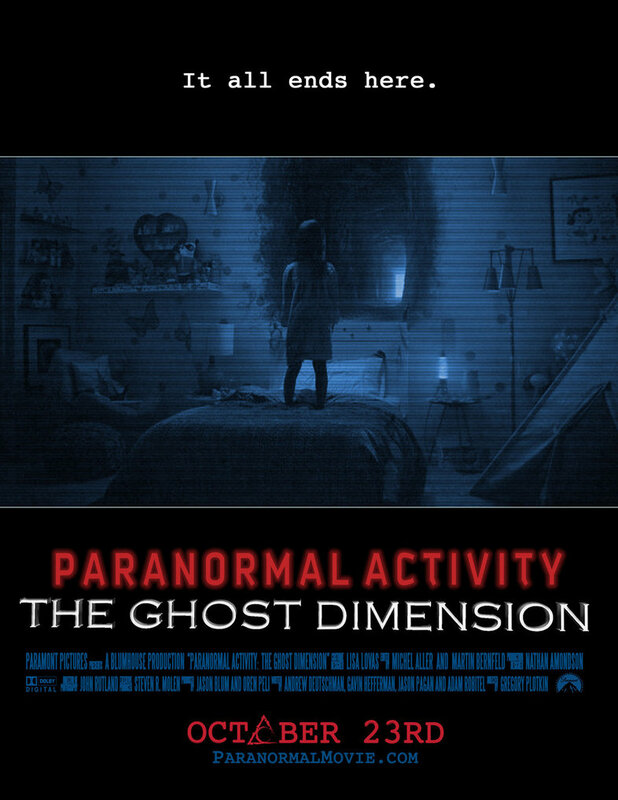 The first 15 minutes of The Ghost Dimension was just like all the others. The same old concept with yet another new family. BUT the set up didn’t mess about. They have had six attempts to nail it. Family moves into house. Strange things happen. Find old camera and videos of creepy kids and mystery cult. Stay in said house and film everything. You know. For a minute, I looked around the cinema. Wondering, “Why the hell was I wearing 3D glasses?” BUT luckily once the old camera was turned on, the 3D soon hit you. It may have been a stupid gimmick that shouldn’t have worked BUT it did. Creepy shadows sweeping past the screen. Tables and chairs flying at you. Faces jumping out. Brilliant. Not enough. Chris J. Murray and Dan Gill were entertaining and highly comical as the brothers delving into this strange cult. What I did like was the fact that the writers knew how parodical the franchise had become and subtly poked fun at the more hokey parts of it quite well. The weird time frames and creepy video messages with Katie and Kristi certainly kept things interesting. And even when that inevitable NIGHT #1 credit came up, I still had that anxious feeling of dread. The slow burning tension as the activity gets creepier and more noticeable. The videos only really tied in the Paranormal 3 arc and briefly mentioned why the girls were chosen to serve Toby. The more Don McManus’ unintentionally comical cult leader Kent spoke about Toby, the more questions I had. Why them? Why was there a 20 year gap? It just made more plot holes by loosely trying to connect everything to appease the silly die hard fans (Like yours truly) who actually wasted their money and time to see it through to the end. Katie Featherston’s character was only mentioned in passing. She didn’t even make an appearance. The writers couldn’t even make the effort to go full circle. What was the point of Hunter? The baby that was stolen at the end of Paranormal Activity 2? None apparently. Even he didn’t make an appearance. Michael Krawic’s Father Todd only provided a name for this mystery cult. A rubbish one. Never mentioned the story line from the Marked Ones. Even though they had stolen the devil door element from it. BUT then didn’t even bother to explain that either. After a reasonably watchable and jumpy 40 minutes, the film desperately ran out of ideas and the finale was a joke. It may have been fast, frantic and tense. BUT it was also lazy, abrupt and insulting. If anything, it made the franchise a waste of time. I sat through the credits expecting more. Something. I respect the makers for producing this multi-million dollar monster franchise from a neglected festival entry. BUT it felt like a case of “Oh well, we made our money’s worth. It’s the last one. Do whatever”. 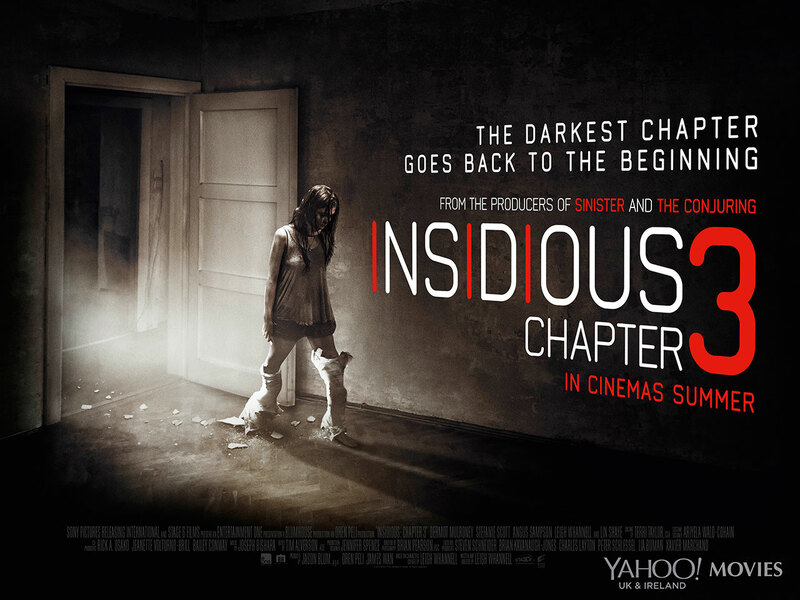 Hopefully this mess will kill off the found horror footage franchise for a while. A nightmare and a horrific end note for all the wrong reasons. Watch if you dare. BUT please. Don’t.